Eddie Aikau was the first official lifeguard at Waimea Bay, on Oahu's North Shore, and at the same time developed a reputation as one of the best big wave riders in the world. Partnering with his younger brother/lifeguard Clyde, the pair never lost a life on their watch. 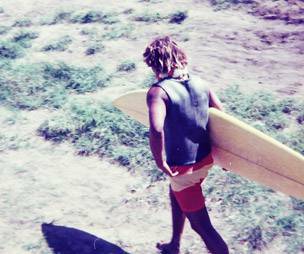 Eddie surfed every major swell to come through the North Shore from 1967 to 1978. He attained a rank of 12th in the world on the early IPS pro surfing rankings. 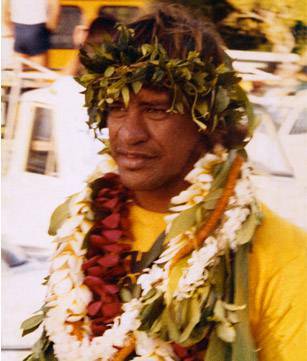 His best contest result was a win in the 1977 Duke Kahanamoku Invitational Surfing Championship. 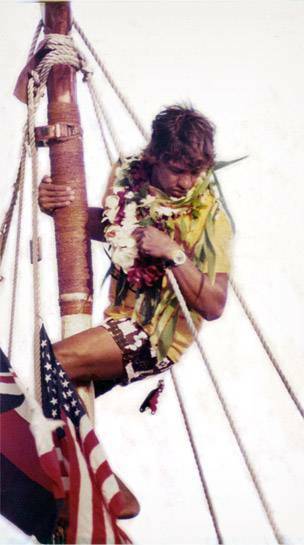 In 1978, Aikau was among a handful selected to join the cultural expedition of the Polynesian voyaging canoe Hokule'a, which set sail from Magic Island, Oahu, bound for Tahiti, on March 16, 1978. Hokule'a soon encountered treacherous seas outside the Hawaiian Islands and the canoe capsized. After a wild night adrift, Aikau set off on his paddleboard on March 17 in search of help for his stranded crew members. He was never seen again. The ensuing search for Aikau was the largest air-sea search in Hawaii history. The Quiksilver In Memory of Eddie Aikau event was established in 1984 held at Sunset Beach in his honor. The event moved the next winter to Waimea Bay and has been a fixture there ever since. It celebrates it's 30th year in 2014. The second-oldest of the 5 Aikau kids, Eddie was the leader of their pack since their earliest days on Maui through to their surfing days on the South and North Shore's of Oahu. "Eddie was a pretty quiet guy but when there was a challenge, or some risk to be taken, or a game to be played that everybody wanted to win, Eddie seemed to rise to the top. He was high risk at an early age," says younger brother Clyde. 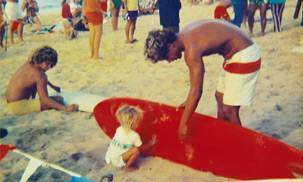 More than a surfer, Eddie was a family man, caring for everybody all the time. 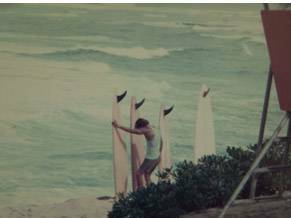 Those outside the family who experienced this most included those he rode big waves with, those he competed with in the early days of professional surfing events and those people he brought together during his travels around the world in the '70s. 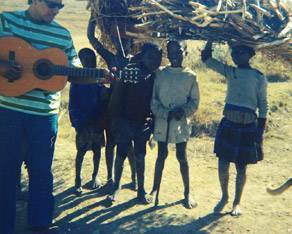 While he never had any children of his own, his compassion and care extended to all who came within his reach. In the true meaning of Hawaiian 'Ohana, or family, Eddie's love extended far beyond blood relatives, crossing oceans and racial lines. In 1967, Eddie became the first lifeguard at Waimea Bay. Clyde joined him in 1969. They worked there together for 10 years up until 1978 when Eddie set out on the voyage of Hokule'a. 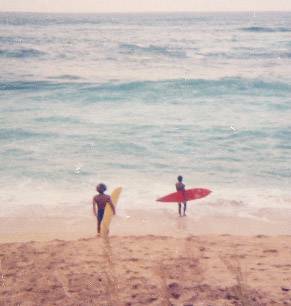 They never lost one person in 10 years - no jet ski, no zodiac, just two brothers with a board and swim fins. Riding big waves wasn't a competition for Eddie. It was more of a personal goal and more about reaching the height of big wave surfing of his heroes at that time - Greg Noll, Mike Stang, George Downing, John Kelly, Sammy Lee - who were a huge inspiration for him. In 1967, Eddie cracked a giant swell at Waimea Bay and made his mark in the world of big wave riding. 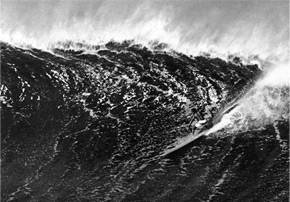 To this very day, November 19th, 1967, is still the biggest day ever ridden at Waimea Bay. "I've ridden almost every swell since then," says Clyde. "When they had the Eddie in 2009, the day just before the Eddie there were some gigantic waves - maybe close to the same size that 1967 had, but definitely not as clean and not as makeable as 1967. 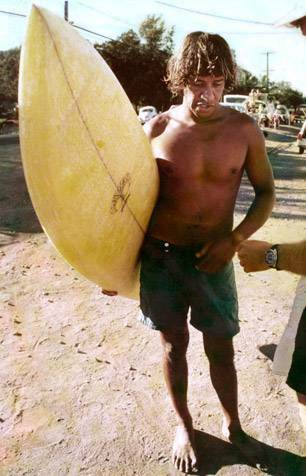 We have a photograph of Eddie from 1967, his board is 12 feet long, it goes down the wave about 5 times. No jet skis in that day. Just paddle in." 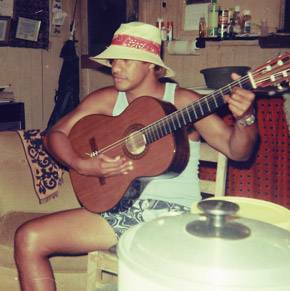 Hawaiian music was a big part of the Aikau's lives. Eddie and Clyde were famous for entertaining at parties and luaus, and as they traveled the world with surfboards and guitars. 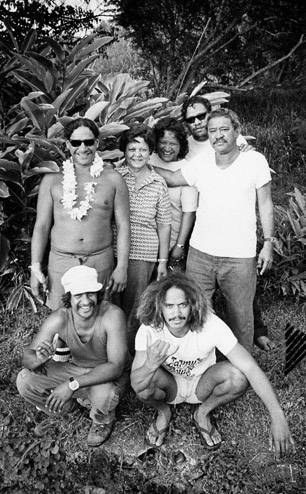 The '70s in Hawaii represented an incredible time in Hawaiian history and for the Aikau family. The music that was coming out of Hawaii expressed the times; the giant waves that were being ridden were blowing minds. The North Shore was a quiet place where waves could be 35 feet but there might be no one on the beach. It was a pure time. 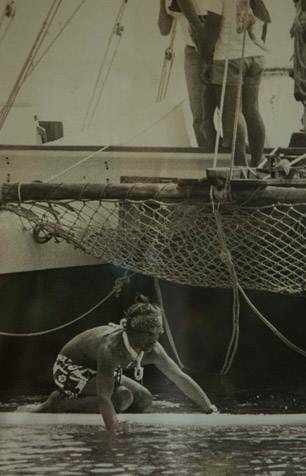 In 1978, Eddie embarked upon an ill-fated second voyage of the Hokule'a - a voyaging canoe that traced the ocean migration and navigation of Polynesian ancestors. Hokule'a capsized in heavy seas just outside of the Hawaiian Islands and Eddie paddled off on his surfboard in an attempt to reach the islands and secure the rescue of his crew members. In the end, all but Eddie were recovered. The Hokule'a was a symbol of the Hawaiian nation, the Hawaiian culture, the Hawaiian people, and everything that was Hawaiian in the mid-70s. Eddie had to participate with about 500 other young Hawaiians from around the islands who wanted to be on the Hokule'a. Only a handful were ultimately selected and Eddie was one of them. For Eddie it was about the excitement of being on a voyage on the Hokule'a, sailing a vast ocean with no modern instruments, sailing by the stars. During the early to mid-70s, Eddie traveled to South Africa, South America and Australia in select early-era pro surfing events. He was always a central figure in bringing people together and was a pivotal character in maintaining calm and camaraderie on the North Shore when competition intensified the lineups. No one could have imagined how much pride he would bring his people, or that it would ultimately come with the price of his own life. Today Eddie is legendary. Says Clyde: "I think Eddie looked at it like: here I am at this stage in my life, I've already surfed the biggest waves in the world, I've won the biggest contest in the world, I got married to the love of my life... Knowing where he came from and what he did and being satisfied with that, having saved thousands of lives at Waimea Bay since 1967, I think he was really content at that time to enter a new world, a new adventure, a real activity that could bring a lot of pride to himself, to his people in Hawaii and especially to his family." Says Clyde: "Eddie Would Go to me doesn't necessarily mean involvement with only the ocean. I believe Eddie Would Go if nobody else would go. Eddie Would Go where people wouldn't go. Eddie Would Go and help people in the water when he didn't even know them. Eddie Would Go on the biggest waves that would pull through Waimea Bay when most people wouldn't go. I think the phrase Eddie Would Go is really a phrase that would ultimately say that one would put themselves out there for the betterment of others. That could relate to anybody - a person from Waikiki, a tourist, or some extreme surfer. Just helping out somebody else is what Eddie Would Go is about." Waimea Bay for the Aikaus is like home. 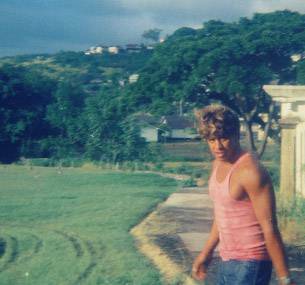 It has been a part of their family longer way before 1967 when Eddie rode Waimea Bay and made his mark. Their closeness actually started more than 100 years before with their great great grandfather - Kahuna Nui HewaHewa. A kahuna nui was one who was an expert in all matters of Hawaiian life and culture - agriculture, spear fishing, building thatched houses, and healing with traditional Hawaiian medicine and plants. He was the number one person that the king of Hawaii would go to for advice. HewaHewa was entrusted in the duties of caretaker of Waimea sugar cane fields, Waimea falls, Waimea Valley and Waimea Bay. He was entrusted in managing and taking care of all the entire Waimea Bay Valley to Waimea Bay. So fast forward to 1967 - Eddie became the first lifeguard, watching over all who came there, and reigned supreme on the biggest waves in the world. It was a natural progression of his ancestry. When the invitees and alternates paddle out and group in the traditional surfers' circle at Waimea Bay on Opening Ceremony day, it's about camaraderie and making a connection to the others who will ultimately share in your experience. "I like to feel and know that we're really all on one level and that we're all out to ride the biggest waves that pull through Waimea Bay on the day that we have the event," says Clyde, who leads the paddle out each winter. "But even more important than that is that there is a physical, there's a body and there's a spiritual connection with the other guys that ride at Waimea Bay. You know, you can win the event... it's a tremendous honor to win the Eddie Aikau. But I think what is even more monumental is that the feeling of being together, to enter the water, to ride the biggest waves in the world, and to know that if something goes wrong, your partner in the heat is going to be there to help you out, because that's what Eddie is all about. He gave his life to save others, gave his life to save thousands of people at Waimea Bay, helped people he never knew. So carrying that throughout the event goes a long, long way."" "Basic big wave riding hasn't changed because you still need to be in tip-top condition, you still need to have the spirit to want to ride the giants, you still need to have the skill. A lot of times when you get into a really bad situation you're going to have to dig really deep into your soul and your reasoning. Your reaching in is what's going to help you survive THE massive wipeouts you're going to take." Clyde Aikau. Earliest record of surfers taking on Waimea. Dickie Cross and Woody Brown paddled from Sunset Beach to Waimea after being caught out by a rapidly rising, giant swell. Cross lost his life in their attempt to reach shore at Waimea in what were reportedly 40-foot close-outs. Seal Beach lifeguard Harry Schurch surfed 10-15 foot waves on the point. Later that day, back from Makaha, Greg Noll, Mike Stang, Mickey Munoz, Del Cannon and Bing Copeland also took it on as the swell rose toward 20 feet. Their session, unlike Schurch's, was captured on film by Bud Brown for what became Waimea's introduction to the rest of the world. Peter Cole, Ricky Grigg and Pat Curren from California focused on taming the beast of a wave that Waimea represented at 20 feet and over. Eddie first surfs Waimea, kicking off a relationship with The Bay that would become legendary. He would ride it for the next 12 years and guard the safety of others as Waimea's first official lifeguard. On November 19, Eddie Aikau rides what is held to be the biggest day ever ridden at Waimea. He surfs flawlessly all day in waves of 30 feet and above. Television coverage, contests, and the pro surfing movement all start to gel. Surfing was becoming a legitimate lifestyle. Waimea developed a solid base of big wave chargers: Mike Diffenderfer, Owl Chapman, Reno Abellira, Sam Hawk, Downing, Cole, Grigg, Kimo Hollinger, Buzzy Trent, Jose Angel, Aikau, Kealoha Kaeo and Tiger Espere. March 16. The Hokule'a, with Eddie and crew onboard, capsizes in the night. Aikau paddles for land to get help for his stranded crew mates but is never seen again. The inaugural "Eddie" contest is held at Sunset Beach where Eddie had won the Duke Kahanamoku Invitational in 1977. The event moved to Waimea Bay the next year. A redefinition of the way Waimea was surfed with continued surfboard refinement. While the takeoff remained the crux of the ride, a new standard of carving turns were applied to the expansive canvas of Waimea. Chargers included: Booby Jones, Tommy Nellis, Richard Schmidt, Brock Little, Clyde Aikau, Ken Bradshaw, Roger Erickson, Mark Foo, Doerner, Tony Moniz, Charlie Walker, Aaron Napoleon, Marvin Foster, Mickey Nielson, Bobby Owens and Johnny Boy Gomes. Waimea's esteemed rating of big-wave riding's zenith was challenged. A booming global surf industry, fully-fledged international world tour, surf forecasting, jet-skis, and mainstream acceptance of the sport were contributing to a new surfing order that transported big wave riders to wave heights formerly unimaginable. Noah Johnson, Ross-Clarke Jones, Tom Carroll, Tony Ray are among the chargers. Purified pursuit. There is no match for the sheer skill required of one man to paddle himself into giant waves, unassisted and alone. With the arrival of the 21st century, Waimea dished up a couple of spectacular Eddie days and a breed of young, big wave hunters took paddle-in surfing on giant days back into the spotlight. Bruce and Andy Irons, Greg Long, Kelly Slater, Shane Dorian, Mark Healey, Ramon Navarro and Kohl Christensen are among those to take the reins of a new era. Inaugural winner, event held at Sunset Beach. 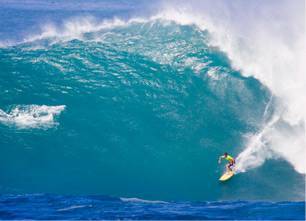 First event at Waimea Bay, onshore 20-foot surf, Feb. 21. Late January, wave heights 25-foot plus. Keone Downing surpasses a crazy tube ride from Brock Little and a perfect wave score from Richard Schmidt to win. The smallest invitee (5'3") was unstoppable in some of Waimea's biggest waves ever, on New Years Day. The event ran January 12, in 20-foot-plus surf. Ross becomes first international surfer to win. On January 7 Slater proved that his supreme status is not limited to the ASP world tour as he fired in 20-30 foot waves. On Dec. 15, Bruce won with a ride to the sand that culminated in a mind-blowing, crowd-roaring closeout barrel to win the 20th anniversary event. On Dec. 8, gnarly 25 foot surf lifted Long to the winner's dais in the final heat of the day. Eddie captures the attention of the globe, registering the highest international media pick-up of any surfing event in history. Record crowd of more than 30,000 lines the beach, cliffs and roadside. In massive waves, John John skillfully to stylishly surfed his way to an even more massive win. It kick-started the year that lead him to his first ever World Title.